Taking the battle head-on: Rahul Gandhi in Parliament. 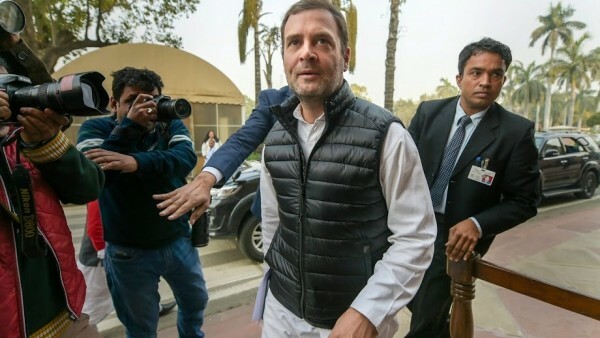 Congress President Rahul Gandhi has now accused Defence Minister Nirmala Sitharaman of "lying" about the contracts given to HAL and challenged Prime Minister Narendra Modi for a debate on the Rafale deal. Describing Sitharaman as a “spokesperson of Narendra Modi”, he said only contracts worth Rs 26,570 crore have been given to the public sector Hindustan Aeronautics Ltd and not Rs 1 lakh crore “as stated” by the Minister while replying to a debate in the Lok Sabha last week on the deal to purchase fighter jets from France. “She spoke a clear lie in Parliament. Contracts of Rs 26,570 crore have been given to HAL. Remarks that more contracts of Rs 73,000 crore have been given is a total sham,” Gandhi told reporters in Parliament House complex. He said the Modi government had given Dassault Aviation Rs 20,000 crore though they had not delivered a single Rafale aircraft but HAL, which had delivered on its orders including helicopters, was awaiting payment of Rs 15,700 crore. He accused the government of trying to wreck HAL. Gandhi also accused Modi of doing “bypass surgery” on the Rafale deal and said Sitharaman should give a “yes” or “no” answer to his question. “I am asking Prime Minister and Defence Minister: Did officials of Air Force, Defence Ministry say that Narendra Modi had interfered in the deal,” he said. The Congress chief said when he raised the question in Parliament, Sitharaman started talking about her middle-class background which was “also not true”. He accused Modi of being scared of facing Parliament. “The chowkidar of the country is scared to face Parliament. He cannot stand in a Rafale debate. Give me 15 minutes with Narendra Modi, the whole country will know (the truth),” he said. Defence Minister Nirmala Sitharaman attacked Rahul Gandhi for raising “incorrect and misleading” doubts regarding her statement in Parliament after the latter challenged her to prove her claim that the Centre gave Rs 1 lakh crore worth of orders to defence PSU Hindustan Aeronautics Limited (HAL) or resign. In a suo motu statement in the Lok Sabha, Sitharaman clarified that she had received confirmation from HAL that during 2014 to 2018, contracts amounting to Rs 26,570.80 crore had been signed with the public sector company and orders worth approximately Rs 73,000 crore were in the pipeline. “Doubts are being raised on my statement made on the floor of the house on January 4 regarding procurement orders in the pipeline for HAL… I would like to set all doubts to rest by adding that I have received confirmation from HAL that during 2014-2018, contracts amounting to Rs 26,570.80 crore have already been signed with HAL and orders approximately of Rs 73,000 crore are in the pipeline,” she said without naming Gandhi. “I had specifically mentioned that there are 83 LCA Tejas fighters ordered worth Rs 50,000 crore, 15 combat helicopters worth Rs 3,000 crore, 200 more helicopters worth Rs 20,000 crore, 19 Dornier transport aircraft worth Rs 3,400 crore, helicopters worth Rs 15,000 crore, and aero-engines worth Rs 8,400 crore. All of them put together amount to Rs 1 lakh crore,” she added. Placing documents related to those orders on the floor, Sitharaman said they “clearly confirm the correctness of my statement made on the floor of this house and (prove that) the doubts raised in this regard are incorrect and misleading”.